Happy Hookah wouldn’t be hard to miss on a brisk stroll to a class that started five minutes ago. Despite its neon veneer, the shop seems rather plain visually — as if it were a person, with flesh and blood just like anyone else. Twenty-six-year-old Thomas* is the co-owner of Happy Hookah as well as a Georgia State alumnus. As he explained, Happy Hookah stands out not by appearance but by products. He and co-owner Jacob Hansard observed a demand and wisely created a supply. Alonzo Herndon was born into slavery in 1858. When he was freed, he spent time as a sharecropper, and eventually came to own a series of barbershops. One of these shops was called “The Crystal Palace” and was located at 66 Peachtree St., now occupied by Happy Hookah. The Bahamas sound pretty great right now, in light of Atlanta’s recent cold gusts and dank, humid air. Students can run from the cold and rain in Happy Hookah’s heated interior. Should they look around the store, they would observe a different kind of dank. Trinkets for sale include water pipes, hand pipes, acrylic pipes, vaporizers, herb grinders, and the always handy, scales, “for accurate weigh-ins.” These don’t seem to have much to do with Hookah smoking despite the smoke shop’s name. It doesn’t take a detective to disclose the marijuana habits of college students. In relevance, Happy Hookah is doubtlessly Georgia State students’ most convenient and abundant source of paraphernalia. When these observations are combined, along with data on college drug use, it’s challenging to deny that marijuana catalyzes the business. This leaves Happy Hookah in a delicate pose, between sustaining itself responsibly and legally and simultaneously distributing products that students use to consume cannabis. Supply and demand dictate that more marijuana means a greater demand for paraphernalia. Could anyone prove that students use Happy Hookah’s products illegally? No. Would employees of Happy Hookah be inclined to speak publicly on the matter? Probably not. The bind is similar to a puzzle — all the pieces are accounted for and fit together — but the existence of any puzzle is casually denied. This doesn’t negate the business nor culture of hookah smoking surrounding the store. Most people probably notice that Anatolia Cafe and Hookah Lounge is only a few stores down from Happy Hookah at 56 Peachtree St. Northeast. The University of Michigan conducted a study in which college students nationwide were asked about their drug use. The following percentages come from this study. Thirty-six percent of college students in 2013 said that they had used marijuana in the past year compared to 30 percent in 2006. In 2013, 5.1 percent of college students had used at least 20 times in the past month, up from 3.5 percent in 2007. Those figures reveal an upward trend. If extrapolated, 2015 sees roughly 38 percent who have used marijuana in the past year and 5.6 percent who have used marijuana at least 20 times since New Year’s Day. Assuming Georgia State’s student body of roughly 32,000 is representative of the national student body, around 12,160 students would have used marijuana in the past year and 1,792 students at least 20 times since New Year’s. A Georgia State student who wishes to remain anonymous shared their experience at Happy Hookah. He or she responded to the question, “If you could have anything in the store for free, what would it be? 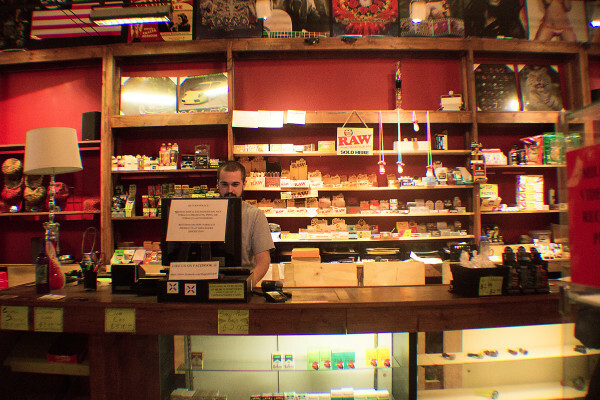 When Thomas opened up Happy Hookah, he knew the historical significance of 66 Peachtree St. Northeast. Happy Hookah’s specialized paraphernalia indeed attracts customers, but the store’s charm can also be attributed to its aesthetic and design. Any patron of the shop would notice the dystopian mural on the store’s right wall from the entrance. Thomas explains its origin and depiction. Thomas may not have a shotgun on his back or a horse to ride, but he does look forward to his future. The shop has its fair share of smoke and mirrors. Despite this, Thomas continues down this road more assuredly than ever; his passion laid its cement and sustains it even now. *Thomas asked that The Signal not disclose his last name.